Waterloo, ON (Apr. 16, 2019) – With the right information, and often for less than $250, homeowners can protect themselves from the increasing risks of basement flooding, according to a report from the University of Waterloo. A new, multi-year project carried out by Waterloo’s Intact Centre on Climate Adaptation has identified the most common flood risks for Canadian homeowners, and has identified the most cost-effective steps that homeowners can take to protect themselves from basement flooding. In light of a major report recently released from Environment and Climate Change Canada, highlighting the increasing risk of future flooding, guidance on home flood protection is timely. Visit www.homefloodprotect.ca for flood protection videos, fact sheets and cost-effective tips for reducing flood risk. Home Flood Protection Program report: Water on the Rise: Protecting Canadian Homes from the Growing Threat of Flooding (PDF, April 2019). Infographic: Water on the Rise: Protecting Canadian Homes from the Growing Threat of Flooding (PDF). 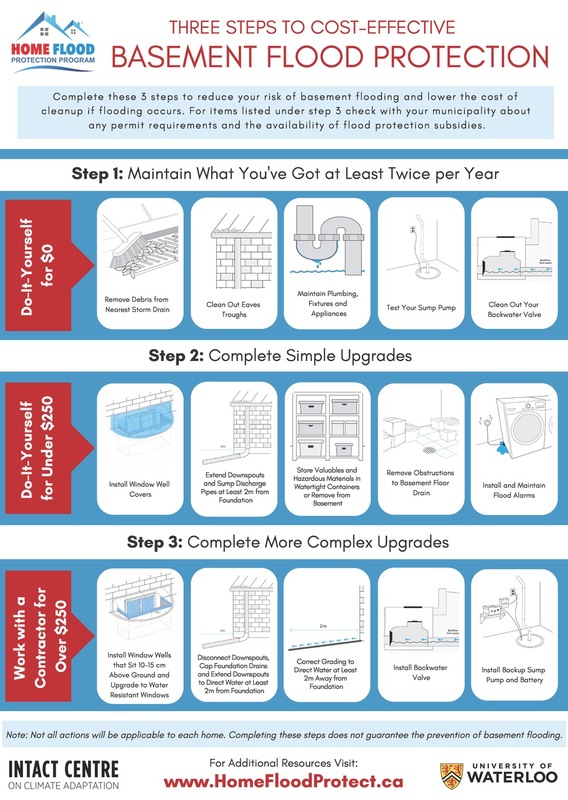 Infographic: Three Steps To Cost-Effective Basement Flood Protection (PDF) – shareable copy of the infographic above. University of Waterloo is one of Canada’s top innovation universities. With more than 36,000 students and the world’s largest co-operative education system of its kind, its unmatched entrepreneurial culture, combined with an intensive focus on research, powers one of the top innovation hubs in the world. For more information about Waterloo, please visit uwaterloo.ca. Insurance Bureau of Canada (IBC) is the national industry association representing Canada’s private home, auto and business insurers. Its member companies make up 90% of the property and casualty (P&C) insurance market in Canada. For more than 50 years, IBC has worked with governments across the country to help make affordable home, auto and business insurance available for all Canadians. IBC supports the vision of consumers and governments trusting, valuing and supporting the private P&C insurance industry. It champions key issues and helps educate consumers on how best to protect their homes, cars, businesses and properties. For more information, visit www.ibc.ca.